Every since The Blair Witch Project made its debut back in 1999, a host of other, found footage films have followed. Ten years later, Paranormal Activity reinvigorated the found footage juggernaut, giving us a micro-budget, horror flick that managed to frighten you in the daytime and make almost $200 million dollars. It's now present day and I've grown so tired of this genre. Years ago the material was fresher. Now the found footage stuff has gone by way of a cinematic, rinse, repeat cycle. Annoying, unknown actors spew improvised dialogue while thinking they are cooler than they actually are. The protagonist is always holding a shaky cam and filming even though danger is constantly around the corner. Finally, there's always a young kid character who sees and hears things that no one else does. Yeah these movies make a modest profit but that doesn't make them admirable affairs. Found footage films are now in a word, "dumbfounded". Anyway, Phoenix Forgotten is my latest review. Yes it is a found footage endeavor but it's much better than stuff like Nightlight, Unfriended, and the disastrous, last two Paranormal Activity sequels. The acting in "Forgotten" is actually decent, the troupers are a tad more likable, and the film's calculated backstory provides a little more tension. 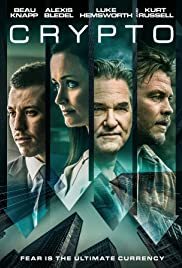 Now could I possibly bring myself to recommend Phoenix Forgotten which oddly, is produced by legend incarnate, Ridley Scott? Not quite. Still, "Forgotten" makes found footage fodder more tolerable to watch than in years past. Director Justin Barber (not to be confused with pop star Justin Bieber) shoots most of "Forgotten" in the style of a guideline documentary. He then has the last half hour veer into complete, retrievable tape territory. Basically, he lets the audience know that his flick is The Blair Witch Project meets aggregate alien abduction. Yeah there are a few fretful moments but as a whole, Phoenix Forgotten fails to drum up the nasty fear and breakneck restlessness that "Blair Witch" projected in 99'. Added to that, Barber's non-visionary ending is abrupt and "Forgotten's" running time barely registers at a squeaky, hour and twenty minutes. It's all harmless but mildly disappointing in the nicest way possible. 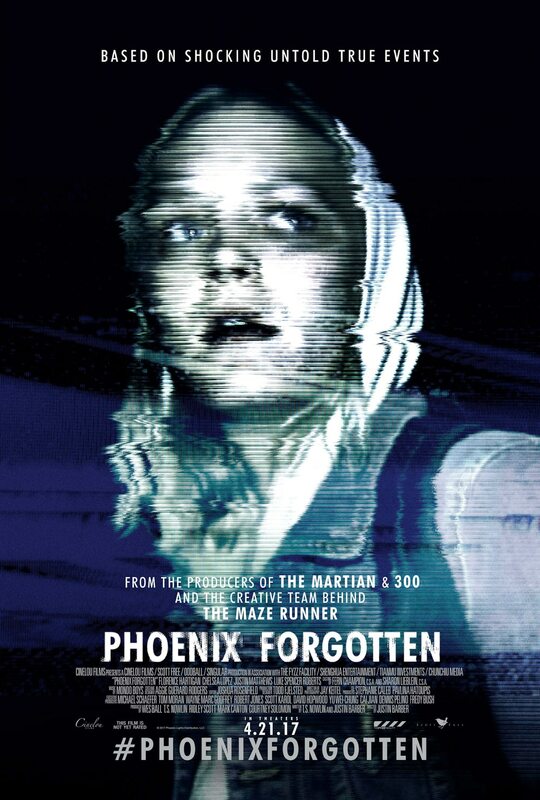 The story of Phoenix Forgotten which I guess is partly true, involves the disappearance of three high school kids who set out to find the source of a UFO phenomenon called the "Phoenix Lights". This all happened in March of 1997. "Forgotten's" main plot point has the sister of one of the vanishing kids shooting a documentary twenty years later. She's bent on finding out what happened to her brother and she's convinced that he's still alive. Phoenix Forgotten documents said plot point with avid creativity and mounting anxiety. Then nothing comes to fruition. "Forgotten's" key intrigue for sixty involving minutes goes on the back burner. 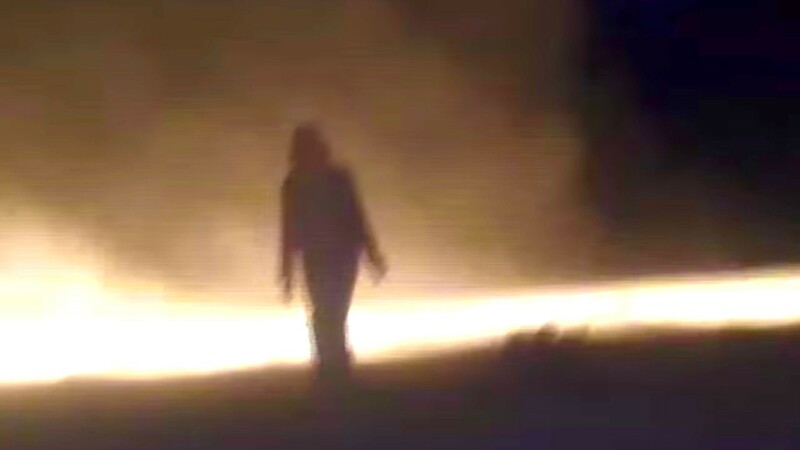 The final twenty is unceremonious found footage in which Phoenix Forgotten literally goes full Blair Witch. Bottom line: Justin Barber in his feature, directorial debut does a so-so job but it's clear that his efforts have rabid continuity problems. "Forgotten" gets a strong yet mixed review from me. Rating: 2 and a half stars.